Now that we're unofficially in transit, I'm really starting to miss the 'familiar' things that we used to look at everyday, notably many of our artworks. 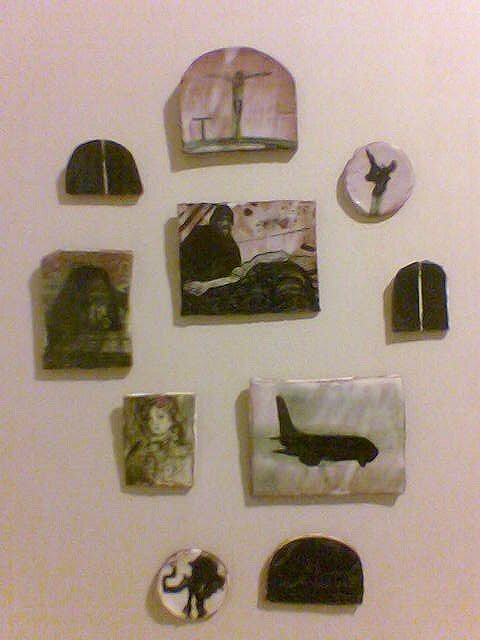 One of the works I seem to be missing the most is a set of glazed ceramic tiles by Scott McFarlane that used hang on an adjacent wall to the stove in our kitchen. While cooking, these works would keep me company and I'd be drawn into their individual symbolism. Jo and I selected these particular works one night after dinner and several beers with Scott. I'm really pleased with our selection as it seems to balance symbols of abstraction, parochial New Zealand, Western art history and contentious contemporary events and paranoia.